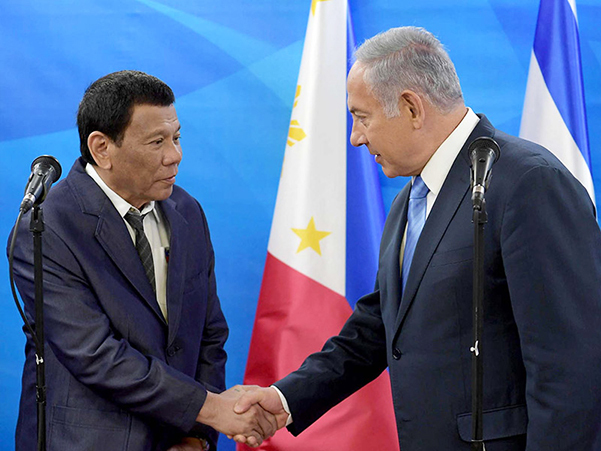 Philippines President Rodrigo Duterte met with Israeli Prime Minister Benjamin Netanyahu last year in Jerusalem. JERUSALEM – In May 2015, when he last formed a government, Israeli Prime Minister Benjamin Netanyahu became acting Foreign Minister and acting Defense Minister. This was, we were told, because he wanted to lure other parties and widen his paper-thin coalition of just 61 of the Knesset’s 120 seats. A week later, the defense portfolio went to Avigdor Liberman after his Yisrael Beteynu party joined up, adding six more seats and a bit of stability. (Interestingly, it would be Yisrael Beteynu’s departure this past November due to differences over defense policies that shaved the coalition back to 61, precipitating the early elections coming in April.) But no one else joined, and to this day, Netanyahu remains acting foreign minister. Diplomacy has taken up a lot of his time these past 45 months, and much of Netanyahu’s diplomatic activity has been aimed at initiating and then strengthening international ties. This is of great help at the United Nations, where support for the Jewish State may have grown over the decades, but not to the level where anyone might be remotely satisfied, and within the European Union, where numerous countries are often highly critical of Israel, and one, Ireland, can be said to be downright hostile. As diplomacy is just as much about scratch-my-back-and-I’ll-scratch yours as it is altruism, Netanyahu has often had to look for friendships with countries whose leaders have friendship problems of their own. One case in point is Hungary. Hungarian Prime Minister Viktor Orbán has angered the leaders of other member states in the EU with behavior that might be described as contrarian, whether it’s policy over open borders and migrants or a crackdown on democratic institutions and the solidification of ties with far-right groups. Regarding the last example, he has never hidden his admiration for Miklós Horthy. Horthy was a devout anti-Communist who allowed Hungary, under his stewardship, to align itself with Hitler’s Germany. An admitted antisemite and initiator of anti-Semite legislation, he nevertheless is credited with having dug in against Hitler’s demand to hand over the country’s Jews. Yet in 1944, having lost his appetite for war, he transferred power to Ferenc Szálasi, head of the virulently anti-Semitic Arrow Cross party, who was more than happy to help out with the Final Solution. Orbán has also used Hungarian-born, U.S.-based liberal financier George Soros, a Jew, as a universal punching bag to promote an unabashedly authoritarian platform, and his anti-Soros campaigns have taken on a decidedly anti-Semitic tinge.  An article that appeared recently in BuzzFeed explains that these campaigns grew out of a relationship with the shadowy American political operative and late Ipswich resident Arthur Finkelstein and his protégé George Birnbaum, both avid fans of finding a boogeyman and then highlighting him (or her) with vicious attack ads. Netanyahu has on occasion used Soros as a punching bag of his own – though minus the anti-Semitic overtones. It’s interesting to note that starting way back, he used Finkelstein to lead his historically negative campaigning, and the BuzzFeed article says it was he who recommended Finkelstein to Orbán. Israel’s prime minister/foreign minister has pursued cozy relationships with other controversial leaders in the neighborhood, including those who, like Orbán, seem to promote Holocaust revisionism to sterilize wartime anti-Semitism. There’s Polish Prime Minister Mateusz Morawiecki, who goes out of his way to play down complicity in the Holocaust by individual Poles. There’s Ukrainian President Petro Porochenko, whose parliament recently declared a national holiday to mark the birth date of a notorious wartime anti-Semite. And there’s Lithuanian Prime Minister Saulius Skvernelis, whose country continues to fete anti-Communists who just so happened to hate Jews and even turned them over to the Nazis. It’s clear why an Israeli leader would go out of his way to court almost anyone who is willing to be friendly to the Jewish state. It’s often less clear why others want to be friendly, although historians have consistently written that people believe Jews – and, by extension, Israel – can open doors in important places. Among EU-member states, experts say that populist leaders seek out Israel as an antidote to liberal policies toward migrants, most of them Muslims. In the U.S., observers say that Trump and the Republican Party are leaning harder toward Israel as the Democrats appear to be leaning away. In Israel itself, people are torn between the need for love and acceptance, and feelings of guilt and shame over getting into bed with some of those willing to provide it. For the time being, though, polls show that if Netanyahu is losing popularity, it’s due to allegations of corruption and not his record as acting foreign minister. Lawrence Rifkin is the Journal’s bureau chief in Jerusalem.